Not all vacations are created equal...sometimes you spend all your free time running from here to there and you find yourself exhausted. 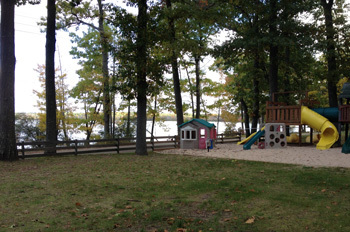 This summer, bring your family to Cabin Fever Round Lake Resort in beautiful West Michigan. 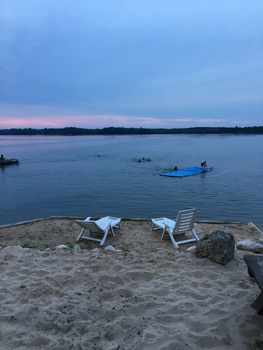 Set within 500 acres in the Manistee National Forest, we specialize in relaxing family vacations and a great camping experience. Our cozy log cabins sleep 2-10 people and feature all the amenities. Enjoy swimming, boating, and fishing on Round Lake, which will keep everyone happy for hours. Owners Dan and Connie Quinn purchased the resort in the fall of 2010. They have been business owners in this community since 1981. You'll love the comfy, warm feeling of staying in one of Cabin Fever's authentic log cabins. Cabins 3 & 4 each have one bedroom and sleep two...perfect for a couple getaway. Cabin 5 has two bedrooms and can sleep four to six people which is great for small families. Cabin 1 has three bedrooms and sleeps eight; Cabin 2 also has three bedrooms but can sleep 10...enough to accommodate two families. 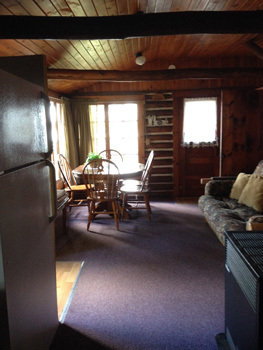 Each cabin offers a fully furnished kitchen, dinette, living room, and full bath. Microwaves, linens, and towels are also provided, so you have nothing to worry about except how much fun you'll have! 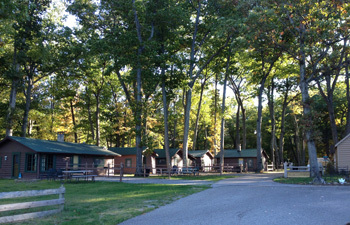 Cabin Fever also has an awesome campground, featuring six sites with full water, sewer, and 50amp service hook-up. Full hook-up is $35 per night and tent camping is just $18 per night. Nothing is better than sleeping under the stars on a warm summer night, and Cabin Fever along Round Lake is the perfect location. Cabin Fever Round Lake Resort is the kind of place you want to bring your family for a good old-fashioned vacation. Use our grills and firepits and eat outside on one of our picnic tables. If you plan to fish, we have a limited bait store, and provide life vests for boating. Kids will love the playground and the waterslide, and there's plenty of space for them to run and expend some energy. If visiting in the cooler months, all cabins have propane heat. Pets are welcome for a small additional charge. If you prefer, we also offer tent and RV sites. While vacationing in the area, be sure to take in some of the local attractions. There are golf courses, beaches, lighthouses, and great restaurants within a 30 minute drive. Enjoy all the summer festivals in Ludington, Scottville, and Baldwin...as well as parks, sculptures, a children's museum, and murals in Ludington. We are located 19 miles east of Ludington, at 6503 E. Sugar Grove Rd, Fountain, MI 49410. If coming from the south, take US-31 to US-10 and head east to Benson Road, then north three miles to Sugar Grove Road. Resort is on right. From the north, take US-131 then west on US-10 to Walhalla. Turn right on Benson, three miles north to Sugar Grove and right to the resort. The Quinn family hopes to see you at Cabin Fever Round Lake Resort for your next family vacation. Whether you're camping or staying in a cozy cottage, fun and relaxation is guaranteed! 6503 E. Sugar Grove Rd.